This is a beautiful read for the Summer - and actually the Autumn also. I came upon this book when I was looking for something graceful, funny, sad, thoughtful. This is it. Part of our gentle fiction category, THE PRICE OF WATER IN FINSTERE is not strictly speaking fiction - it's a memoir, informed by an intensely felt observation of her environment. Malmsten's writing is lush, succulent and rich for the joys and incongruencies of life. "In the same way as there's a partner for every person, there's a place. All you have to do is find the one that's yours among the billions that belong to someone else, you have to be awake, you have to choose." With this conviction in mind, acclaimed Swedish writer Bodil Malmsten abandons her native country at the age of fifty-five and settles in Brittany. 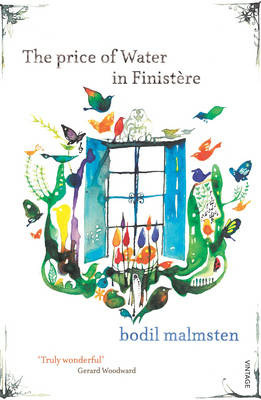 At the heart of this memoir is the conviction that the happiness to be found in Finistère will not allow itself to be, cannot be, expressed in writing - however she does manage to provide thought-provoking, wry and humourous observations on the widest range of subjects: how not to buy plants, the elicit pleasures of bargain-hunting, the misery of writer's block, social democracy, racism, tulipomania, the stubbornness of bank managers, the controlling of moles and slugs, death, political hypocrisy, the delights of wild weather.